The Boilerplate ships pre-configured and runs out of the box if the Installation steps are followed properly. However most components can be freely configured. 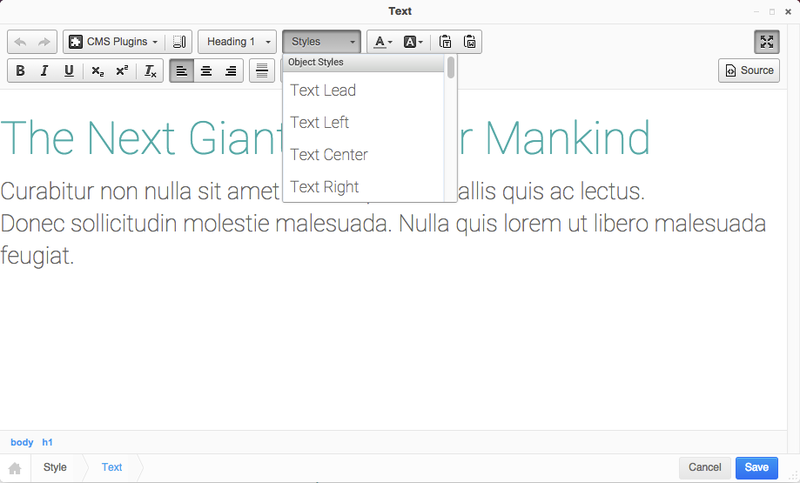 The CMS allows for custom style sets within the editor. This ables the user to choose certain presets or colours. We already added the general Bootstrap utilities for you. The file can be found at: /static/js/addons/ckeditor.wysiwyg.js. © Copyright 2014, Divio AG. Revision 8f44bc65514fbe9d0a4aaf367f1c144f19f93b72.